AlluGuard77 is designed to be secure and has been awarded the Secured by Design Police Preferred Specification status. To achieve Secured by Design, doors are independently tested and certified to the standard, giving you peace of mind that your new garage door is secure to a Police approved standard. 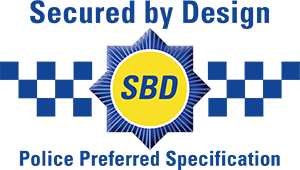 Secured by Design (SBD) is the UK Police flagship initiative that is founded on the principles of designing out crime and crime prevention. SBD supports one of the Government’s key planning objectives: the creation of secure, quality places where people wish to live and work. Research carried out by Huddersfield University shows that residents living on Secured by Design Developments are half as likely to be burgled and two and a half times less likely to suffer vehicle crime. Secured by Design Developments also benefit from 25% less criminal damage.